At our Fort McMurray dental centre, we’ve created a warm, welcoming atmosphere where you can relax and receive the care you need. Our friendly team will welcome you, and our family dentists will listen to your needs and goals. We look forward to establishing long-term relationships with our patients, as well as dispelling anxiety and changing the way you view visits to the dentist! With sedation dentistry, any patient can receive fear-free dental care. River City Dental Clinic has been one of Fort McMurray’s sources for quality family dentistry since 1980. Our dentists take their devotion to providing conservative care seriously. We will always recommend what we feel is best for your oral health and with modern technology, we can provide conservative solutions quickly and effectively. 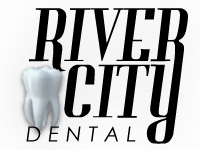 Call River City Dental Clinic to schedule an appointment or consultation with a dentist. Fort McMurray residents can depend on over 30 years of experience from our team of family dentists who provide the comfortable, expert care you deserve. Visit our dental office today to learn what keeps our patients coming back again and again.